...to bake pumpkin! Hooray for fall flavors! However, in our geographical area, we're being warned that there is a pumpkin shortage this year because of all the flooding and rain we got this summer. I don't know if it is a valid issue or just a really smart marketing ploy designed to get us all to frantically run out and buy huge quantities of canned pumpkin. What can I say? Either way, it is working. Every week, when I go grocery shopping, I pick up a big can of pumpkin and squirrel it away in my kitchen cupboards. 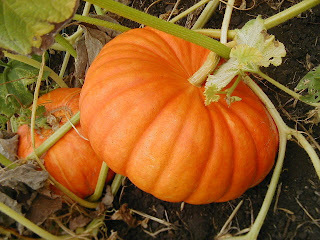 I would much rather have a pantry full of pumpkin than none at all for these fall and winter months! I love baking with pumpkin - breads, pancakes, muffins, cupcakes, cookies (my mom-in-law has the best recipe EVER created), pies and sweet rolls. I've added a new recipe to the list...doughnuts. I do have some experience making cake-style doughnuts, which I think are far superior to yeast-based doughnuts...at least when it comes to making them at home and having them last more than an hour before going stale! My first foray into homemade doughnut making was last year - check out the recipe here. If you want a chuckle, read about my first (and so far only!) attempt at a yeast-based doughnut here. This recipe was fantastic and I absolutely loved the spiced glaze, I think I might add that glaze the next time I make my apple cider cake doughnuts! The original recipe is from one of my favorite blogs: Annie's Eats. 1. To make the dough, combine the flour, baking powder, baking soda, salt and spices in a medium bowl. Whisk to blend, and set aside. In the bowl of an electric mixer, combine the sugar and butter and beat until well blended. Stir in the egg, then the egg yolks, and then the vanilla until incorporated. Combine the buttermilk and pumpkin in a liquid measuring cup and whisk together. With the mixer on low speed, add in the dry ingredients in three additions alternating with the pumpkin mixture, beginning and ending with the dry ingredients. Once the dough is mixed, cover and chill for 4 hours in the refrigerator. 2. On a well-floured work surface, roll or pat out the dough to a ½-inch thick round. Sprinkle the surface of the dough with flour. Using a 2½ to 3-inch round biscuit cutter, cut out rounds of dough. Use a smaller cutter (or a wide pastry tip) to cut a hole out of the center. Reroll and cut the dough scraps as necessary. 3. Add oil to a large saucepan or Dutch oven to a depth of about 2-3 inches. Attach a thermometer to the side of the pan and heat the oil to 365-370˚ F. Add the rings of dough to the hot oil so that they are in a single layer and not touching. Fry, turning once, until both sides are golden brown and doughnuts are cooked through, about 3-4 minutes total. Use a skimmer/strainer to remove from the oil and transfer to a paper towel-lined rack. Bring the oil temperature back up to the target range before repeating with the next batch of doughnuts. Use the same process for the doughnut holes, frying for a shorter time. 4. To make the spiced glaze, combine the powdered sugar and spices in a small bowl. Add the cream and whisk to combine, until a thick glaze is formed. If necessary, add a bit more milk to thin the glaze out. Dip the doughnuts in the glaze. Allow the glaze to set before serving.